The Brunstrom Memo It appears he would like to restrict our access to real road safety information. Are you worried Mr Brunstrom? The following astonishing memo from Mr Brunstrom was leaked to us. We publish it word for word and believe it to be genuine. Comments below. I am writing to you in my capacity as Chair of the ACPO Road Policing Business Area. I wish to bring to your attention the actions of a Mr Paul Smith and the website safespeed.org.uk. The Department for Transport has been inundated with various requests from Mr Smith concerning speed limits, speed enforcement and Government policy on speed management - Mr Smith’s sole intent seems to be to discredit Government policy and the sources of advice on which it is based. He has progressively increased over the last two years the number of professional and public bodies he corresponds with. He starts with pointed questions about statistical and other factors, and when he receives a response he publishes the correspondence criticising and mocking its content aggressively. He is persistent in his follow up correspondence, demanding replies and usually raises further issues seeking to escalate the debate on his terms. He will use any replies received to populate the website www.safespeed.org.uk which now has many pages featuring his correspondence with numerous respected organisations and individuals and their replies. From this correspondence an address in Scotland is given for Mr Smith. The Department for Transport in its most recent e-mail correspondence with Mr Smith in September stated that whilst they encourage dialogue on the topic of speed, speed enforcement and road safety, they felt it would be unproductive to continue corresponding with Mr Smith given the lack of publicly available research to support his claims and assertions about vehicle speeds and collisions. DfT have advised Mr Smith that unless he is able to provide such material as evidence they will not enter into any further correspondence with him on these topics. The ‘safespeed’ web site raises a number of areas of concern. 1. The website is opposed to all Government policy in respect of speed enforcement. 2. It provides standard proforma letters to encourage visitors and supporters to lobby government and public agencies over speed enforcement policy. 3. It offers advice on how to avoid penalty points (including asking a friend or relative to take the points claiming the driver is deceased) and the cloning of number plates. 4. Encourages those working in the police, government and partnerships to provide information to the site in confidence and anonymously. 5. There is a recurring catch phrase "let's make speed cameras as unacceptable as drink driving". 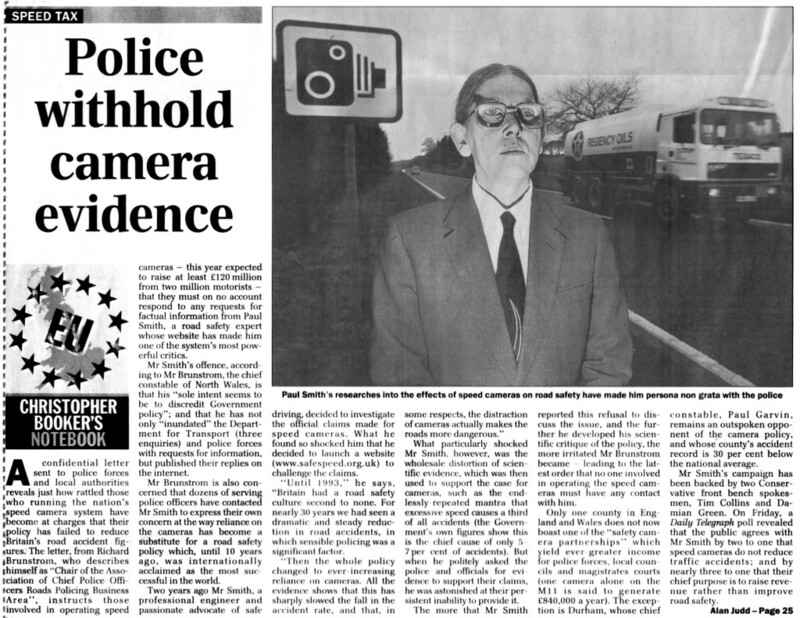 It is clearly evident that Mr Smith continues to canvas the Service and Safety Camera Partnerships in order to populate his website and to discredit the Government's speed enforcement policy. Mr Smith does not frequent respected road safety or transport circles or participate in open debate in the mainstream, but appears to operate on the "fringe". As stated earlier the DfT, along with many of the other organisations that have encountered Mr Smith, have taken the decision that they will no longer correspond with him or parties acting on behalf of safespeed.org.uk. I fully endorse this stance and would ask for your support in this matter. The purpose of this letter is to make you aware of this stance and to give consideration to supporting both my view and that of Government in dealing with this matter. Maybe not - this is clearly a serious matter. We have complained to the Prime Minister direct, and will publish the results of our complaint in due course. Perhaps we should not be surprised by this action. We have decently and courteously asked Mr Brunstrom - in writing - for answers to basic road safety questions. The replies we have received have been evasive and hopelessly inadequate. See the original letters (here). When Mr Brunstrom failed to answer important simple questions we complained to the North Wales Police Authority (here). The complaint is ongoing, and we are hoping for a further response shortly. We have also asked Mr Brunstrom important basic road safety questions in the local press. (here) and (here). We would have no cause to "mock" genuine and comprehensive answers. Mr Brunstrom, allow me to make our position 100% crystal clear. We want the truth about road safety in the UK. We don't want lies or evasions of simple questions. We're not going to stop asking questions or demanding answers. Non-existent and inadequate replies speak volumes in themselves. Road safety information belongs to the public and you have absolutely no right to attempt to withhold it, nor to attempt to influence others to withhold it. We don't trust that your policies are based on science, or even understanding. We think your policies are based on hopeless oversimplification. The fact that you appear to be unable to defend them or support them in writing seems to us to be extremely revealing. We believe that people are dying unnecessarily on the roads because of your misguided policies. It's an extremely serious matter that calls for open and honest public debate and informed scientific investigation.